On Rosh Hashana night we do a strange thing: we eat all sorts of different fruits, as well as fish and maybe even the head of a lamb. On each of these foods we say a special yehi ratzon. One may wonder, what exactly are we trying to accomplish when we eat these fruits? Is it supposed to be some sort of tefillah, or is there some other reason for it? The source for eating the special foods is the Gemara in Kerisus 6a. The Gemara first establishes that there is an idea called simana, which will be explained later. It goes on to say now that we have determined that there is such an idea of simana, one should eat the following fruits, and begins to list them. What is the purpose of the yehi ratzons? The Chayei Adam refers to a Ramban in parshas Lech Lecha (12:6) to explain this strange custom. The Ramban is discussing the idea of ma’aseh avos siman labanim (the acts of the avos is a sign for their children). This means that whatever happens to the avos will in some form happen to the children. In his discussion the Ramban has the following line: “that when a gezaira is brought to an act that gezaira is effected”. Meaning, when there is a decree upon a person and the person goes and kind of acts out that decree then the decree will last. For this reason, he says we find many times that when a navi will make a prophecy, he will then act out that nevu’a so that it comes true. For example, Yirmiyuhu when he prophecized about the downfall of Bavel he told someone to tie a stone to a book and throw it into the river, because that is what is going to happen to Bavel. 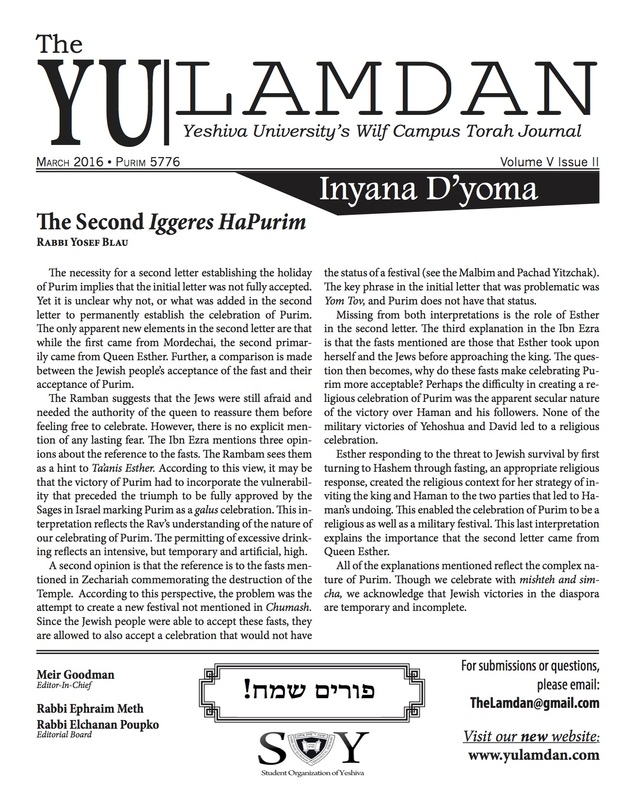 The Chayei Adam explains the strange custom of these yehi ratzons based on this Ramban. We do all of these things to act upon the decree that has been decreed upon us. Just like Hashem decreed that we should have a sweet year, in order to “strengthen” that decree we do an action that represents a sweet year. What comes out of this Chayei Adam, then, is that we are eating these fruits after Hashem has judged us. It’s not that we are asking Hashem to decree upon us a good decree. Rather, we are asking that the decree that was already decreed come true. The gemara in Krisus , however, does not seem to explain the idea of “simana” this way. Simana in the Gemara means that you aren’t sure whether your business will be successful or not so you can raise a chicken and see whether it will be fatty. If it is fatty then that means that your business will be successful, and if not, it won’t. Or if you want to know if you will live out the year you can light a candle in your house and see if it stays lit. What does this idea have to do with eating a sweet apple and saying that it should be a sweet year? The Drisha on the Tur asks this question and answers that really they aren’t the same, and the Gemara was saying the following: Just like there is no problem of superstition in the other cases, so too there is no problem here. Returning to the previous idea, it seems a bit strange that we need to act out the decree so it comes true. I would like to suggest and explanation. Perhaps we can say that when we act out the decree the decree will be fulfilled not for some reason that is totally beyond us, but because we are living out the decree. Meaning, when we eat the apple and say we should have a sweet year, we are actually causing that decree to begin. When we eat the apple, since it’s sweet, the eating of the apple itself is part of the fulfillment of the gezaira, giving us a sweet year. This approach is difficult, however, because there are other simmering that do not amount to a fulfillment of the correlated gezaira. For example, when we eat gourd and say that the evil decrees against us should be torn up, there is no way that eating a pumpkin fulfills that idea.